Cargo Operations at Lahore go Fully Automated with the launch of Cargo Export Module. 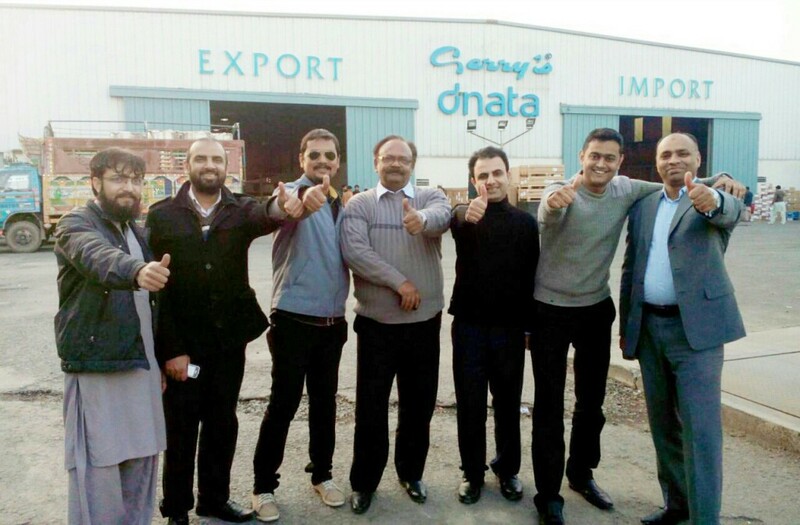 Gerry’s dnata achieved and recorded another title on March 11, 2016 by becoming The First & the Only Ground Handler in Pakistan to launch Cargo Export Module . (Cargo Import module was already launched last year - February 2015) . Customer airlines cargo representatives, Key Cargo Agents / Forwarders, Civil Aviation Authority and Anti-Narcotics Force officials were also invited at the inaugural ceremony. The IT team at Gerry’s dnata was awarded the Najm Award for timely and effective implementation of DCS solution to support ground operations team and the customer airlines. The IT team at Gerry’s dnata wins the Najm Award for timely and effective implementation of DCS solution to support ground operations team and the customer airlines. 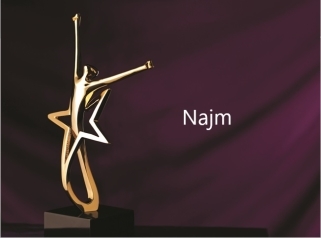 The Najm Award is the reward and recognition program of the Emirates Group. The Najm, which means “Star” in Arabic, recognizes and awards exceptional behavioral competencies. 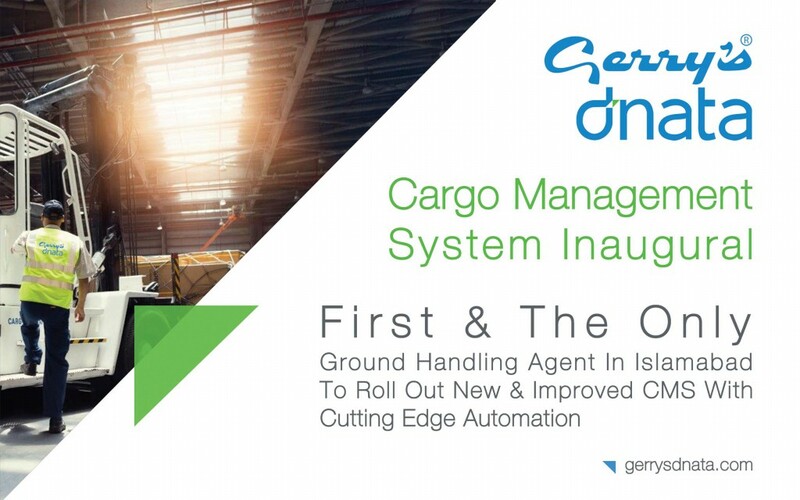 On 19th February, 2015 - Gerry’s dnata launched their New and state of the art Cargo Management System at Islamabad, making Gerry's dnata the first and only ground handler with nationwide automated import operations. The management at Gerry's dnata are certain that the new Cargo Management System along with the modern ICT infrastructure and equipment would enhance the quality of services for their customers and would also improve and optimize the overall cargo handling operations. Customer airlines cargo representatives and Pakistan Custom senior officials were also invited at the inaugural ceremony which began with Mr. M.F.Rathod ‘s (Manager IT / Gerry’s dnata) presentation and physical demonstration at warehouse. Deployment of new state of the art Cargo Management System at Lahore. 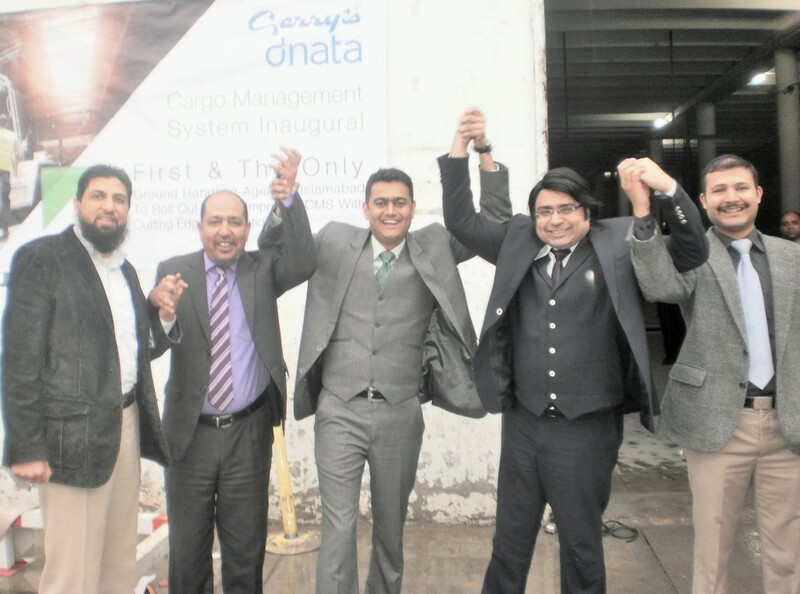 On 22nd January, 2015, Gerry's dnata deployed their new and state of the art Cargo Management System at cargo complex Lahore – Pakistan as part of their technologically advanced operations strategy. The new Cargo Management system is expected to not only enhance the quality of services for their customers but also to improve and optimize the cargo handling operations work-flow from physical handling, warehousing, planning and monitoring to management reporting (statistics, figures and reports). The deployment of the Cargo management System was coupled with related advanced and modern IT infrastructure and equipment. An inauguration ceremony was also held which was attended by customer airlines cargo representatives at Gerry’s dnata Cargo Complex Lahore. It began with a presentation delivered by Manager IT Gerry’s dnata and then a walk through physical demonstration was given at each location, which was admired by all their customer airlines representatives. Startup of Mihin Lanka at Lahore. 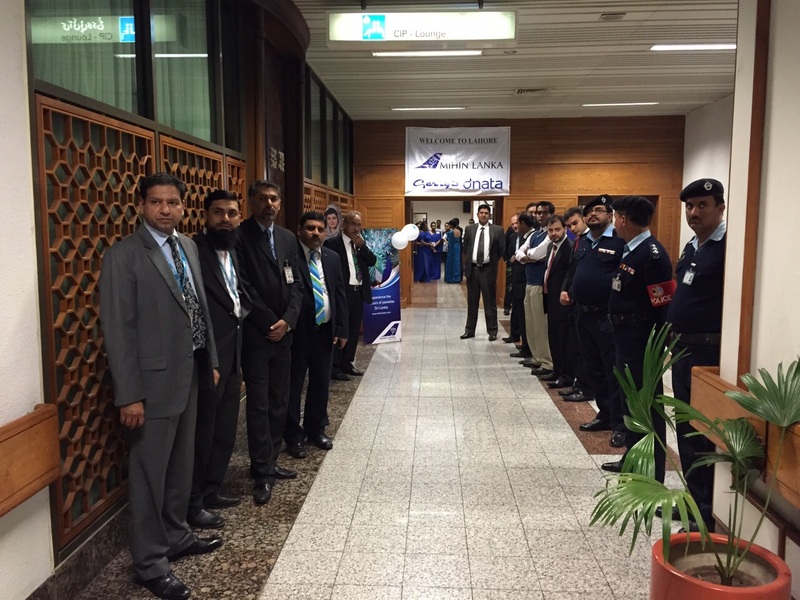 Monday 24th November 2014, Mihin Lanka, Sri Lanka’s national low-cost carrier recently commenced operations to Pakistan with an inaugural flight from Colombo to Lahore. 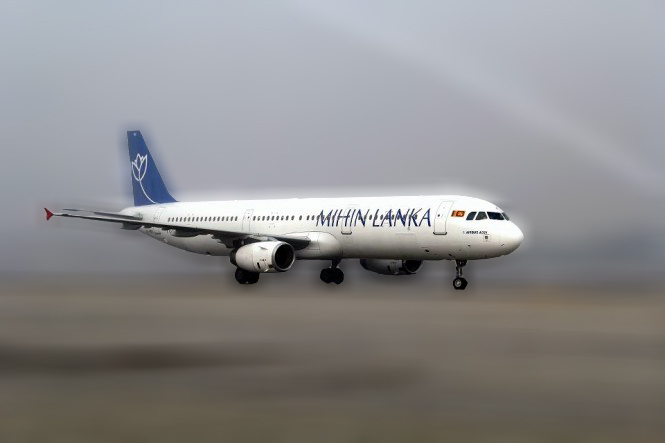 The first Mihin Lanka aircraft from Sri Lanka (4RMRD A321) landed at Allama Iqbal International Airport in Lahore, Pakistan and an inaugural ceremony was held to commemorate the event. The ceremony was graced by distinguished guests including H.M.B. Herath, Consul General for Sri Lanka in Karachi, Air Chief Marshall (retired) Jayalath Weerakody, High Commissioner of Sri Lanka in Pakistan, Pervez Hanif, Consul General for Sri Lanka in Lahore, Manoj Mendis, Country Manager of Mihin Lanka in Pakistan, Hemalal Thalgaswatte, a member of Mihin Lanka’s Board of Directors, Mihin Lanka, Khawaja Ali Kamal Majeed, CEO - TCB Aviation, Abdul Khaliq, Manager - Finance, TCB Aviation and Ahmed Hassan, Manager-Business Communication, TCB Aviation. Also present was local staff from the Mihin Lanka team in Lahore including Sheraz Aftab, Marketing Manager, Mihin Lanka, Azfar Hassan Khan, Manager –Sales, SriLankan Airlines, Muhammad Amir Kamyll, Manager-Sales, Mihin Lanka, Farhan Younus, Sales Manager – Cargo. The ceremony was also attended by members of the Mihin Lanka team from Colombo including, Asanka Fernando Head of sales , Lal Perera Head of worldwide sales Srilankan Airlines Shannon Ambrose Manager Ground Operations, Ingrid Guruge, Consultant Marketing, Piuma Kanderagama, Manager HR & Admin and Geethani Wellage, Manager - Yield Management. Also in attendance from the Mihin Lanka team were Dharini Senanayake, Executive Secretary to the Chairman and CEO, Anjali Mekala, Ticket office Manager and Savin Fernando Training Executive. The auspicious inaugural ceremony was also attended by the higher management of Gerry’s dnata, Mihin Lanka’s Ground Handling Agent in Pakistan, which is part of the Emirates Group (dnata Dubai). Gerry’s dnata team members present at the event included Shabbir Hussain, Operation Manager –Pakistan, Salman Ahmed Khan, Manager Airport Services LHE, Syed Adnan Assistant Manager- Admin, Abid Nawab, Duty Manager as well as senior officials from government departments such as Civil Aviation. Gerry's dnata becomes Pakistan's first RA3 certified Ground Handler. Gerry's dnata is the first Ground Handling Company to be a validated RA3 in Pakistan. Gerry's dnata Karachi, Lahore & Islamabad stations have successfully completed RA3 validation conducted by EU Aviation Security Validator Mr. J.G. MackKnight which took place on May 18th, 19th & 20th in Karachi, 21st, 22nd in Lahore & in Islamabad on 24th, 25th May 2014. This is a proof that Gerry's dnata Standard Operating Procedures of Cargo Handling, Ramp Handling, Safety, Security, Maintenance & all other Operational or Management processes are already compliant with the new EU regulations and the hard work of the Management, Trainers & Internal Auditors is applaud able. There were zero observations raised by the auditor and we got the certification without any pre – audit, as required & desired by others. Mr. J. W . MacKniight said "It is my opinion that Gerry's dnata (PVT) Limited Pakistan meets the EU Standards and PASSED the validation in order to become an EU validated RA3. The results of the pre – validation assessment and the on-site validation contained in this report". “We take pride in our achievements as a team and commit ourselves to further enhance the quality of services provided to our Customer & Customers customer"
Push Back Tractor TMX-450-45 (TLD). 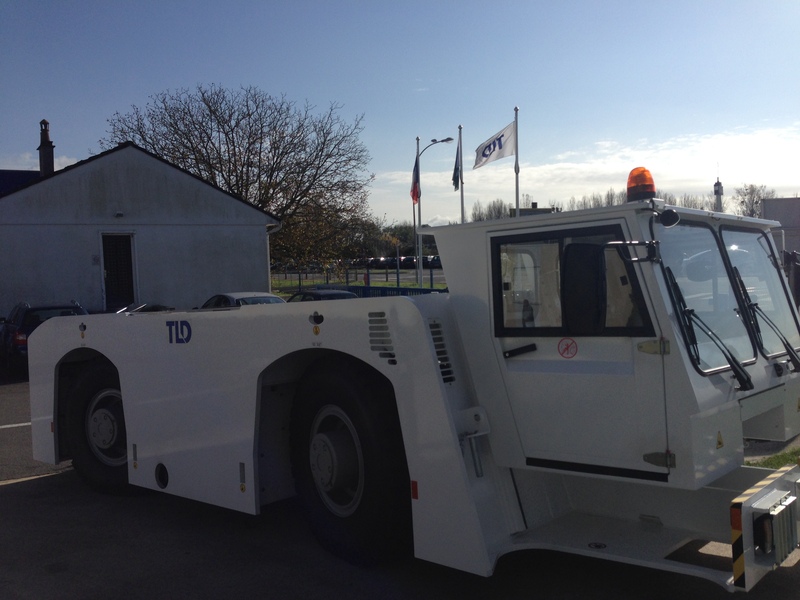 Lower Deck Loader TXL-838 (TLD). Portable Water Truck WSP-900 (TLD). 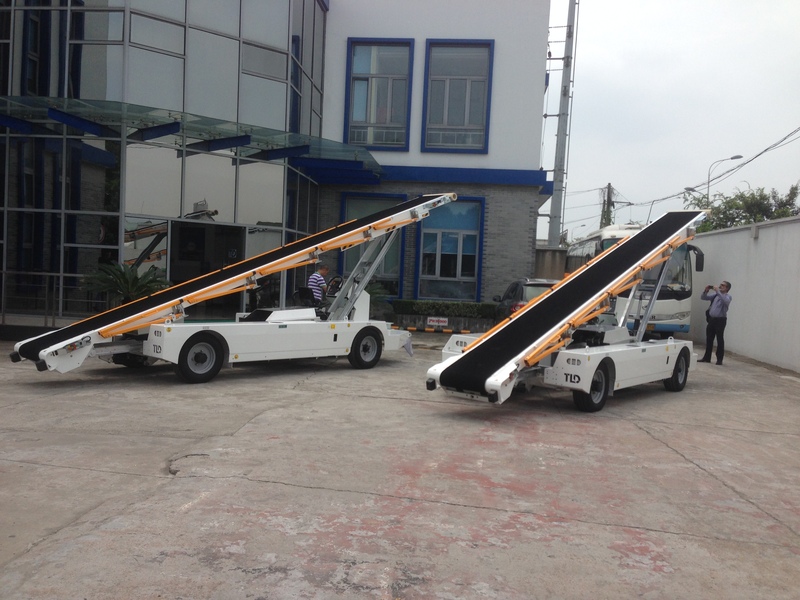 Mobile Conveyor Belts ( TLD). In addition to the above, another investment in GSE is currently under process with our suppliers and we will continue to invest in upgrading and modernizing our GSE fleet to ensure that our customer airlines continue to receive the world class level of service that they have to come to associate with the Gerry’s dnata brand. 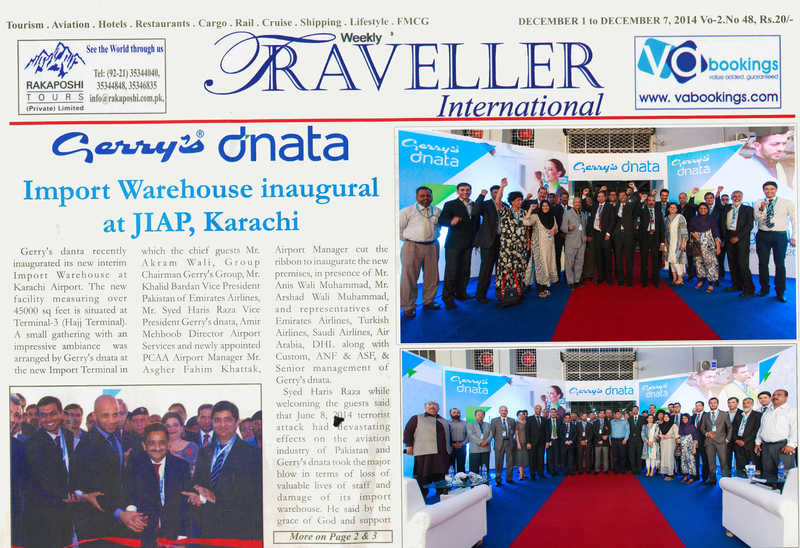 Gerry's dnata recently inaugurated its new interim Import Warehouse at Karachi Airport. The new facility measuring over 45000 sq feet is situated at Terminal-3 (Hajj Terminal). A small gathering with an impressive ambiance was arranged by Gerry's dnata at the new Import Terminal in which the chief guests Mr. Akram Wali, Group Chairman Gerry's Group, Mr. Khalid Bardan Vice President Pakistan of Emirates Airlines, Mr. Syed Haris Raza Vice President Gerry's dnata, Amir Mehboob Director Airport Services and newly appointed PCAA Airport Manager Mr. Asgher Fahim Khattak, Airport Manager cut the ribbon to inaugurate the new premises, in presence of Mr. Anis Wali Muhammad, Mr. Arshad Wali Muhammad, and representatives of Emirates Airlines, Turkish Airlines, Saudi Airlines, Air Arabia, DHL along with custom, ANF & ASF, & Senior management of Gerry's dnata. Syed Haris raza while welcoming the guests said that June 8, 2014 terrorist attack had devastating effects on the aviation industry of Pakistan and Gerry's dnata took the major blow in terms of loss of valuable lives of staff and damage of its import warehouse. He said by the grace of God and support of industry friends and well wishers they have managed to acquire the new premises from Civil Aviation Authority and in record time they have upgraded it to cater their clients. He also thanked CAA, Immigration Customs, ASF and all concern authorities for their support and specially thanked Mr. Akram Wali Muhammad and the entire Gerry's Group for all out support and encouragement in this humongous task where they had to rebuild everything from the scratch. Mr. Akram Wali Muhammad was of the view that when the intentions are good God's support comes automatically. He said the support of PCAA and partner airlines were overwhelming. Today, he said, with the support of all they have managed to inaugurate this new Import Warehouse. Mr. Zia-ul-Haq, Cargo Manager Gerry's dnata in his address said that the new Import Warehouse has an area of 45000 sq feet and is equipped with all the facilities to handle the incoming cargo. He said their staff had worked tirelessly day and night to get this new facility ready in record time. Mr. Zia thanked all partner airlines , CAA, Immigration, Customs, ASF and all concern authorities for their support. After the ribbon cutting ceremony by Mr. Khalid Bardan and Mr. Akram Wali Muhammad the guests were given a round of the new Warehouse.